How often do you clean your yoga mat? How do you store it? It's distracting and unpleasant to practice on a dirty, stinky mat or on one that is wrinkled, cracked, or torn. Taking proper care of your mat will extend its life, and keep it working well for you for a long time. As a yoga teacher and studio owner, one of my chores is to make sure that our equipment, including the mats, are cleaned and stored properly. I've come up with methods that work well for me, and they'll work for you too. As a yoga teacher, I see many yoga mats at different stages of cleanliness and degrees of wear-and-tear. Some people bring in brand new mats that have never been unrolled, while others bring in obviously well-loved, well-used mats that have seen better days. Some are dirty from extended use over time, or from dirty bare feet and hands over a short period of time. I can tell if a person has pets if the mat has claw marks or pet hair on it. I also keep a good supply of yoga mats at my studio, for students who prefer to use those, and it's my responsibility to clean them and make sure they're in good shape. If you keep your yoga mat clean and store it properly when you're not using it, it will work better for you and it will last longer. Dirty mats don't have as much stickiness to them, and mats that are carelessly stuffed in a closet while not in use may develop wrinkles, creases, or gouges, making them less usable. Here are a few methods that I use to help me take good care of our studio mats. Clean mat, ready for practice! How you choose to clean your yoga mat will depend on how dirty it is, how thick it is, and what it is made of. Here are a few methods to consider. This simplest method will work for all yoga mats - use a solution of mild soap and water to scrub your mat down using a sponge or towel. Rinse well, and hang dry. If it's still looking dirty, repeat the process. Liquid Castile soap is a good option. I also use dish soap like Palmolive, or an environmentally-friendly dish soap. You can scrub down your mat outside in a clean, grassy area, or in your bathtub or shower stall. Carefully press water out of the thicker, more porous mats to have them dry faster. You can also roll them up in a towel to get rid of excess water. I use this method on the eco-friendly 5mm TPE yoga mats that we have at the studio. During the warmer weather, I take them outside, spray them down with the hose and sponge them with a little dish soap. Then I thoroughly rinse them and hang them to dry. PVC mats are the common and inexpensive yoga mats that most of us are familiar with. Many of the mats at my studio are the thin but durable 2mm PVC mats. I put these through our clothes washer. Since I have about 20, I load 3 or 4 in at a time, along with a towel or two (I think that helps with the agitation). I use a mild clothes detergent like Tide Free and Gentle, and set the agitation and spin cycles to Gentle. Most people will tell you not to put your mats through the dryer. I do use a dryer with these thin mats, but ONLY on low and ONLY for 10 minutes to remove excess water. I put in a towel or two to help absorb the water and to bat them around a little in the dryer. Then I hang them to dry the rest of the way. This is a great way to get rid of odors, and to naturally disinfect your mat. Use 1 part water to 1 part vinegar in a spray bottle and spray your mat. Or you can rub it down with a sponge or cloth. 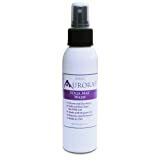 This is a good option if your mat isn't visibly dirty, but needs some odor control or sweat-removal. While these mat cleaners aren't absolutely necessary, they are easy to use and practical, especially if your mat isn't very dirty. These cleaners are often made of environmentally friendly ingredients. A few options are shown on the right. The wipes in particular are very useful after a sweaty yoga practice. You'll find that after you wash your mat, the stickiness is restored. Your mat will look better, smell better, and will work better for your yoga practice when it's clean. 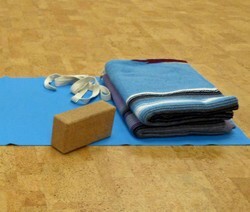 Natural rubber yoga mats can be cleaned with the methods used above. Open celled natural rubber mats absorb a lot more water, so typically people would deep clean them just occasionally, since they take a long time to rinse and dry. Do not dry these mats in the sun or in a dryer. Your mat will start to deteriorate quickly if you do. Hang the mat neatly over a drying rack or a sturdy shower curtain rod. Your mat will get dirty, at least if you use it! But you can keep it cleaner and in better condition for longer if you are careful in how you use it and store it. Practice yoga with clean feet! Most likely your hands are clean when you come to yoga class or do your home practice, but are your feet? If you like to go barefoot in your house or especially outside, check your feet before you get on your mat. Lotion makes your hands slip around on the mat. Not fun in Downward Facing Dog Pose! And the lotion will accumulate on your mat, making it even more slippery, and more prone to collecting dust and dirt. Dogs and cats can't resist getting on your mat if it's out in the open. I've seen a number of yoga mats with claw marks from people's pets. The mat will still work up to a point. But you can keep your mat looking nicer by storing it away from pets when you're not using it. If you end up getting cat or dog hair on your mat, take a lint roller to it. Thicker mats should be rolled. Thinner mats (2 or 3mm) can be neatly folded or rolled. Folding your thicker mats will leave creases that can eventually lead to tearing or cracking. Do You Take Care of Your Mat? Do you keep it clean and neatly stored when not in use? Yes I keep my mat relatively clean and neatly stored when not in use. I've never cleaned my mat, but it looks okay. Yoga mat? Don't have one. Most Importantly USE Your Yoga Mat! A clean yoga mat is no use to you at all if you don't use it! Go take a class! Go do your yoga practice! How Do You Take Care of Your Yoga Mat? So far my yoga mat looks clean and I haven't washed it yet. Besides, it is too heavy. I was wondering how to take care of it - thanks for the tips.